A pair of former Rydal Penrhos Rugby Academy stars, Adam Sabri and Euan Humphreys, were part of the coaching staff during the Christ College Brecon 7s tournament, held at the end of last month. 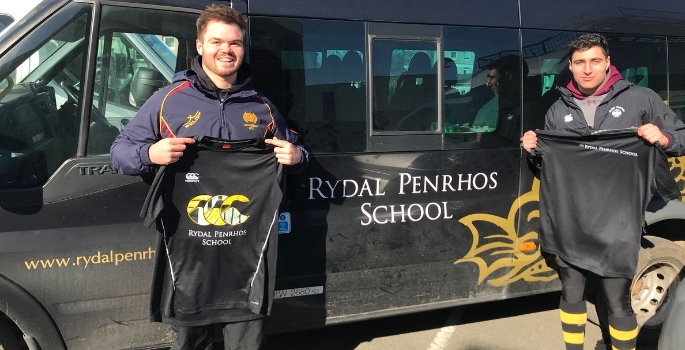 The duo left Rydal Penrhos last summer and have been thriving at two high-profile clubs, having received expert coaching during their time at the school, thanks to the ongoing Academy partnership with RGC and the Welsh Rugby Union. Both contributed significantly to the success of the young Gogs at various events at U16 and U18 level, alongside Dan Owen, Nick Dundee, Efan Jones and Henry Maitland-Davies. Adam, a former Head Boy and Senior Rugby captain, is currently plying his trade for Newport in the Principality Premiership, and the highly touted prospect has turned in a series of fine performances for the Amber and Blacks throughout the season. Powerful forward Humphreys is also making a name for himself as part of the Cardiff Met side down south, and both join a long line of former pupils that have gone on to achieve national and international success at prestigious clubs across the country. Director of Sport Allen Boyd, said: “It was fantastic to have Adam and Euan with us for the tournament, and they provided some fantastic insight that will stand each member of the squad in good stead going forward.